A weekend without crafting, Oh No! Crafting is not my favorite thing to go without but I am headed to Chicago for my Aunts wake and funeral. Another not so fun thing to do. Because I am unable to craft and share something new I decided to share something I did over the summer. This card I call my circus card because of all the colors. 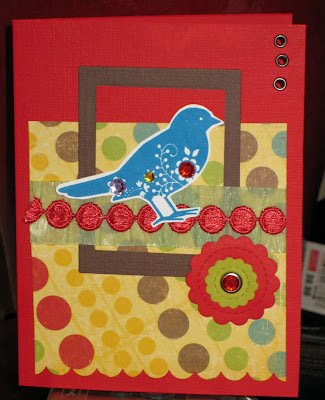 The bird is from Stampin up as is everything else except the designer paper and ribbon. Let me know what you think. I love hearing from everyone. If I don't get the opportunity to post again have a great weekend! Here is another card I made for Unity's September Challenge. I just received my LeChic Vintage scrapbook kit and I just had to incorporate something. I had paper and stamps to choose from so I went with a little bit of both. My paper ~ the green and black strips that border the spider newsprint is from the new LeChic Vintage set while the other paper is all Making Memories. My stamp -is from the new LeChic Vintage set! I just love this set. Stickers are from making memories and I make the flowers with my nestabilities SU's build a brad. Lastly the silver cord is SU's. Well I hope you like it. Make sure to check out the other card I created. My husband prefers that one, what about you?